... or lack of it, in our moment of pride! Except when it suits them of course. Here we have another example of a Government Department treating our medal with contempt. Meddling when they should be medalling! They can't wait to say that they want nothing to do with it. To them, our PJM, earned out there in the jungles of Malaya and Borneo in a war on terror that we won, is a tin trinket not worthy of being worn with pride. But they want to make sure we know that they know that formal permission has not been granted for us to wear the PJM. 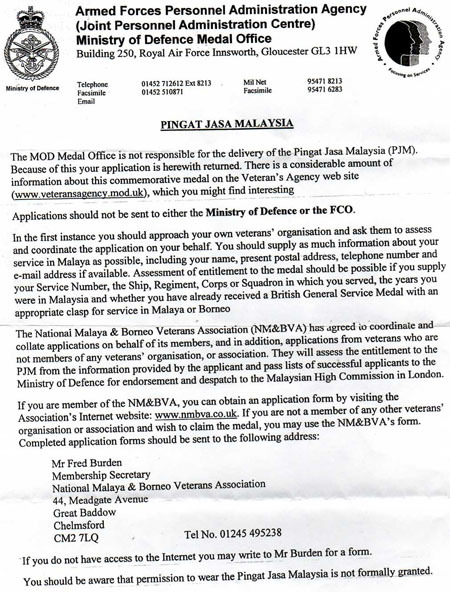 Was it really necessary to add that last line when returning veterans' innocently mis-directed application forms? Only if you want to poke veterans in the eye! Back to the letter. Here it is - don't read it until after you've nipped down to the Chemists to buy quantities of Valium ... you'll need it. When reading it, picture yourself as the recipient of the letter which accompanies the return of your best attempt at applying for your PJM which you earned, are proud of, and had anticipated receiving in response to your application - not this snivelling, impersonal, drivel. And how will the MOD Medal Office deal with widows and other next of kin. Will they employ the same roneo'd snub? I wouldn't put it past them! Comment = Absolute ignorant dribble. Not only are they demeaning the PJM by classing it as a Commenorative medal (tell the guys who got shot at and had to endure hostile jungles whilst fighting for Queen and country) they are wiping their hands of it and saying not us mate, try etc etc. Why should we keep having to go with begging bowl to ask for our medal? Time for action, not talk. Comment = I have written to my MP - favourable answer received. I have written to Baroness Symons - no answer - should I be surprised? And I sent off my application to Fred Burden - unaware if he provides updates? I am not short of medals but it would be nice to achieve recognition for my Far East Service - I went there aged 18 and had the brakes put on my career it would be nice to have something to show for this sacrifice.